For some reason the year (1999) when the remakes of The Haunting and the House on Haunted Hill sticks out in my mind a lot. My brother really wanted to go and see the latter. So we went and I really enjoyed it. It was the very first time I had ever seen that 32 frame per second type ghost effect. You know where it ends up looking really frigging weird, and unnaturally fast? It wouldn’t be until years later that I would finally sit down and watch the original. 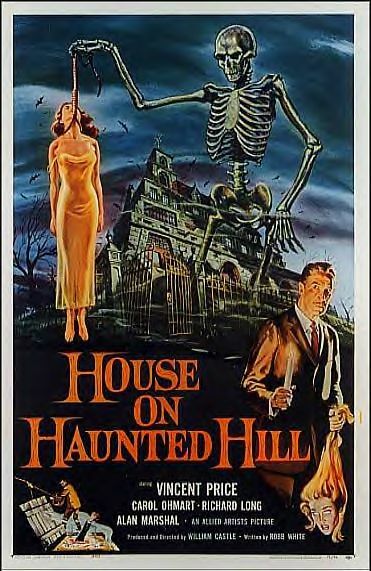 The house on Haunted Hill was released in 1959. The film was directed and produced by B movie legend and shameless promoter William Castle. The film stars Vincent Price (I swear this is just a coincidence) and Carolyn Craig. The basic plot is this. Fredrick Loren (Price) is an eccentric millionaire who hosts a party at a supposedly haunted house. He gathers together a group of virtual strangers and tells them that he will pay them each ten thousand dollars if they would spend the night in the mansion. He says he is doing this because his wife had the idea of throwing a “ghost party”. He informs the guests that the servants will be leaving the grounds and locking all of the doors and they won’t be opened again until 8 AM the next day. Anyone who makes it, will be given their money. This is all treated as light hearted at first and each of the guests seem to be enjoying themselves. None of the guests are very remarkable. Waston Pritchard is the current owner of the property is there who knows the most about the place. He tells the others that his brother and sister-in-law were murdered in the house and he is legitimately terrified of the place. Nora Manning (Craig) is just a secretary for one of Lorens companies. Ruth Bridges is a columnist; Lance Schroeder is a pilot and finally Dr. David Trent is the resident psychiatrist. I honestly had a hard time telling some of them apart. The one thing they all have in common is that they need money and this seems like a golden opportunity. It seems that spooky things start to happen to Nora only who freaks out and hysterically screams at numerous different situations. One of the moments that stood out for me is when she encounters the creepy old hag with the long fingernails that scares her half to death. The movie relies for sudden shocks and special effects for their scares, but it’s a pretty typical case of Nora seeing something and everybody arriving too late. That all changes when the body of Loren’s wife is found hanging from the staircase and everyone seems dumbfounded. At this point it isn’t really clear what happened. They had shown scenes of Loren and his wife fighting and it’s reasonable to assume she had killed herself. The movie takes a swift turn to a whodunit motif that carries it for the rest of the story. Castle was well known for his use of theatre gimmicks and this movie was no different. During the films final moments a skeleton rises out of an acid bath and starts to stalk it’s prey. Apparently when that moment happened in the movie the theatre goers were treated to a plastic skeleton flying over their heads. It was things like that which elevated this B horror movie into the cult classic that it is today. The famous macabre director Alfred Hitchcock was so impressed with the movie that it was said that it would inspire him to make the classic Psycho. 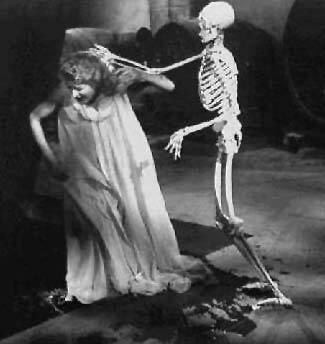 Among the skeleton gag the movie also breaks the forth wall both at the very start and the very end. It’s not too often that this happens anymore (probably for the best). Well, since its release this movie has become public domain, so it’s free to watch in a variety of ways. I recommend that people check it out when they got a chance. It has some great thrills and special effects so cheesy they become genius. Plus, it has the unforgettably talented Vincent Price. Okay I promise this will be the last Price movie for awhile. See yah next time, and thanks for reading! "Do I have something in my teeth?!"